Here is today's harvest from my kitchen garden. We had the large broccoli head last week, but these little sprouts have come since....so I picked them. The cabbage hearts were solid so I cut them too. I left the stalks in the hopes of another picking of leaves later. I thought it might be a good idea to look at the climbing beans carefully as I could see one bean hanging....what a surprise when I got all those green ones.....Climbing French Bean "Hunter". Always a reliable doer in the garden. And the purple "Cosse Violette"....surprised to find them ready too. Not many yet, but they are only halfway up the arches at the moment. I went briefly to the plot and harvested three whopping heads of broccoli "Marathon". I think I will have to freeze some of it as there is only so much that even greedy veg eaters like us can eat before they begin to go yellow! I saw the plotter who is diagonally next door to me. She had heard that I am wanting to give up half of my plot and has now spoken for the lower half (next to the hedge, where the shed is at the moment) for her daughter who is coming home after doing some gardening courses. They won't want it yet, and I still have crops in there so we are all happy. So.....a productive day in more ways than one. The sharing sounds a good plan for everyone and you can pick the daughters brains too! If ever I doubted we had a long, cold spring here (Oregon, USA), your harvest is convincing. 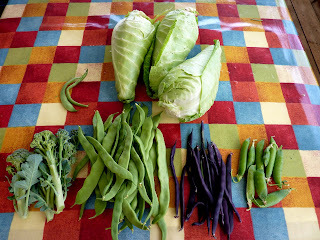 I just picked the first broad beans (March sowing) yesterday, and my cabbages are nowhere near heading. No cucumbers at all (I had to finally give up on the poor plants and put lettuces in their place), and the first broccoli last week. Usually we should be matching you fairly closely for harvest times. It is strange times in the garden. That purple bean has an amazing colour! Really vibrant. Fresh veggies! I live in Texas - USA and wish we could have a plot that produced so much goodness as yours. Perhaps we'll move to a climate that will allow us to create what you have! Oh, wishful thinking. I have an allotment blog called Paul and Vickys Allotment. Unfortunately, due to continuing back problems, I will reluctantly be giving up my plot soon. When I have taken the crops and sold the shed it'll be given back so that hopefully someone on the long waiting list can do it properly as it deserves. As for blogging.....I have been too ashamed of the state it has got into to take any pics lately. Sorry uou are having to give up the plot - I'll keep a watch for you blogging about your garden - not much to write about in winter is there? Just the tunnel. Some salads in there. And of course the Seed catalogues. I have bought my stuff already for next year and should really blog about that. I am undecided though about continuing with this particular blog as it was really allotment oriented....hence the name. Might have to start another with a different name. Sorry to here about yout back having to make you give up your plot, It is not nice having back problems and trying to look after an allotment. I hope you will soon be able to look after your vegetable patch in your garden as there is nothing better than easting your home grown food. If you do continue blogging please let me have a link so that I can put you on my blog. In the meantime I am taking the present link away from Down on the Allotment. Springcleaning !